“The Secret Mission of William J. Burns” is a true story that begins in Amman, Jordan. The year is 1983. William J. Burns, a 27-year-old U.S. Foreign Service officer, is on his first overseas post to Amman, Jordan. War is raging between Iran and Iraq. Burns volunteers to drive a truck load of communications equipment across the desert from Amman to Baghdad, Iraq, a distance of 500 miles. As soon as the freshly-minted diplomat reaches the Iraqi border, he is arrested and held for two days before being escorted to the capital by police. As Burns would later recall, his career “didn’t exactly get off to a rocket-propelled start.” After that two-day delayed mission to Baghdad, however, the career of William J. Burns has taken off like a rocket. 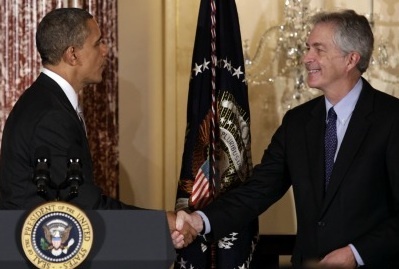 Currently serving as the U.S. Deputy Secretary of State, Burns (pictured above with President Obama) has just completed a far more significant secret mission. He has led “a secret U.S. back channel to Iran going back to before the June election of Iranian President Hassan Rouhani”. Burns was tapped to lead the US diplomatic effort to establish a bilateral channel with Iran, which gained momentum after the exchange of letters between US President Barack Obama and Iranian President Rouhani in early August, US officials said. Led by Burns, the US’s second highest ranking diplomat and a former lead US Iran nuclear negotiator, the US effort to form direct contacts with Iran also includes two officials from the Obama White House: Jake Sullivan, the national security advisor to Vice President Joe Biden, and Puneet Talwar, the National Security Staff senior director for Iran, Iraq, and Persian Gulf affairs, US officials confirmed. to halt most of its uranium enrichment efforts, eliminate its stockpiles of uranium already purified to near weapons grade quality, open its facilities to daily monitoring by international inspectors and significantly slow the construction of the Arak plutonium reactor. Nuclear weapons can be assembled using either enriched uranium or plutonium, and the new pact is designed to make it difficult, if not impossible, for Iran to gain enough of either material for a bomb. In the confines of 1600 Pennsylvania Avenue on September 30, just after the Jewish high holidays, Obama revealed to Netanyahu that his administration had been engaged in secret, high-level diplomatic talks with the mortal enemy of the Jewish state. Netanyahu’s allies in the U.S. Israel Lobby, including members of Congress, led by New York Senator Charles Schumer and his Republican colleague from Illinois, Senator Mark Kirk, in concert with pro-Israel media, and conservative Jewish organizations, have all joined Israel’s side in an effort to scuttle the agreement with Iran. This is not the first time Benjamin Netanyahu has encountered William J. Burns. 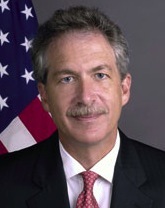 Sixteen years after his first low-level posting in Amman, Burns returned to Jordan in 1998 as the U.S. ambassador. The new ambassador began his second tour in Amman a few months after September 25, 1997, when, on a sidewalk in Amman, a team of Israeli assassins unsuccessfully tried to kill Hamas political bureau director Khalid Mishal, by injecting poison in his ear. Burns was not serving in Jordan at the time. He was, however, the U.S. ambassador who had to deal with the diplomatic aftermath of the failed Israeli assassination attempt. That connection calls for consideration of a book that appeared twelve years after the failed assassination attempt. Australian journalist Paul McGeough published a meticulously well-crafted account of the street attack and its aftermath, Kill Khalid: The Failed Mossad Assassination of Khalid Mishal and the Rise of Hamas. (The New Press, 2009). The story itself quickly faded from western consciousness. For this reason, it is important to recall the story of the failed Israeli assassination attempt on Hamas leadeer Khalid Mishal at this time, when William J. Burns, the former U.S. ambassador to Jordan, once again enters and troubles Benjamin Netanyahu’s tightly controlled universe. 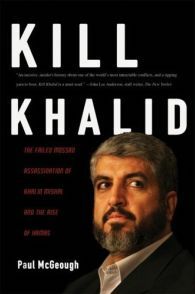 Kill Khalid provides considerable insight into an important moment in history for anyone wishing to comprehend the unbridled passion of Benjamin Netanyahu, a passion that heats up whenever he is confronted by anyone who fails to give him precisely what he demands. Paul McGeough’s book should also be read as background for recent findings on what is now widely accepted as the poisoning death of Palestinian President Yasir Arafat. Note the similarities: Israel’s method of killing an opponent, which was ordered in Khalid Mishal’s case by the then Israeli Prime Minister Netanyahu, was planned to be carried out in secret. The poison used on Mishal was slow working and almost impossible to detect. The plan was for Mishal to receive the poison in what was to appear to be an accidental encounter with a man on the street. According to the Massad plan, the Palestinian Hamas leader would proceed on his way until the poison did its deadly damage far removed from the street location where he had been poisoned. Fortunately for Mishal, Jordanian police captured two of the assassins immediately after the street attack. Jordan’s King Hussein (father of the current Jordanian King Abdullah) telephoned Netanyahu with the news that he was holding his Israeli agents, all of whom he was prepared to execute for attempted murder. Hussein had learned from the captured Israeli team members that they had brought with them an antidote that could save Mishal. They admitted they carried the antidote in case one of the assassins was accidental poisoned. To underscore his anger and determination to save Khalid Mishal, who was a guest in the King’s nation, King Hussein called U.S. President Bill Clinton to deliver the same warning. The word to Washington was blunt: Israel must save Khalid or Israel’s agents will die. Clinton called Netanyahu. An humiliating (to Israel) agreement was reached. Israel would produce the antidote immediately, which it did. Furthermore, Israel was forced to release a number of Israeli-held Palestinian prisoners, most notably Sheikh Ahmed Ismail Hassan Yassin (1937- 2004), a founder of Hamas, who served as the spiritual leader of Hamas. The Sheikh, who was almost totally blind and wheel-chair bound, was released and returned to Gaza to great acclaim by the Palestinian public. Netanyahu lost his reelection bid in July, 1999, defeated for Prime Minister by Ehud Barak. Netanyahu returned to politics in 2002 as Foreign Affairs Minister (2002–2003) and Finance Minister (2003–2005) in Ariel Sharon‘s governments. It was during Netanyahu’s term as Finance Minister that Ahmed Yassin was killed in an Israeli attack on March 22, 2004. Israeli AH-64 Apache helicopter gunships fired Hellfire missiles that killed Yassin and both of his bodyguards. The attack came while he was being wheeled out of an early morning prayer session in Gaza city. The period of time after that humiliating failure by Israel’s Massad agents to kill Khalid Mishal, was a dark period in the career of Israeli Prime Minister Benjamin Netanyahu. Jordan and the U.S. were the instruments of his humiliation in that dark period. And just across the Jordan River, starting a few months after Netanyahu’s humiliation, there sat William J. Burns, the U.S. ambassador to Jordan, two countries that humiliated Netanyahu in 1997. Netanyahu returned to power as prime minister in 2009. Khalid Mishal is still an Hamas leader. In the Burns-Netanyahu story that began with a 27-year-old William J. Burns driving communication equipment across a desert to Baghdad, Benjamin Netanyahu has suffered a major political setback due in large part to the work of William J. Burns. Burns (at right), the man who was the US. ambassador to Jordan in 1999 when Netanyahu lost his election, has now negotiated an agreement with Iran, worked out in secret, to lift crippling sanctions on the Iranian economy. “Bill is the gold standard for quiet, head-down, get-it-done diplomacy,” Kerry said of Burns. That accolade came from Time magazine writer David Van Biema, in a 1994 profile of Burns he wrote for the magazine’s list of 50 people under-40 who will make a difference. Burns is a U.S. diplomat who has distressed Benjamin Netanyahu by working, initially in secret, to hammer out an agreement that is designed to relieve the suffering of the Iranian people, and curb the further spread of nuclear weapons. He did not do this to distress Netanyahu, but to save him from further humiliating himself and his nation. Who is Shilbey Telhami, this academic and author, who sings the praises of William J. Burns? As Secretary of State John Kerry continues to give much time and effort to the Palestinian-Israeli issue, with plans to convene negotiations in Washington this week, his critics have come from right and left: With all the pressing issues, why is Mr. Kerry focused on this one? Critics miss the point: No issue is more central for Arab perceptions of the United States — even as Arabs are focused on their immediate local and national priorities. America has little influence in the events unfolding in the Arab world, from Egypt to Syria. More centrally, Arab perceptions of Washington are less dependent on short-term American policy and more a product of deep-seated Arab mistrust that ties everything the United States does to helping Israel and controlling oil. Shilbey Telhami has Arab street cred*. When did we last hear someone with authentic Arab street cred sing the praises of an American Deputy Secretary of State? These are, indeed, remarkable times. In the picture at top, U.S. President Barack Obama shakes hands with Deputy Secretary of State William Burns at the Diplomatic Corps holiday reception at the State Department in Washington on December 19, 2012.The picture appeared on an Atlantic blog. It was taken by Yuri Gripas for Reuters. *Street cred: “ Commanding a level of respect in an urban environment due to experience in or knowledge of issues affecting those environments. As in: He’s been thru it all. His street cred is undeniable. This entry was posted in Iran, John Kerry, Middle East Politics, Netanyahu, Obama. Bookmark the permalink. “The secret mission of William J. Burns”, is no longer a secret. Thanks Jim for an eloquent report. to threats of Bibi Nat. who stands against any US initiative for peace that does not suit his right wing motives. has no match by any diplomat/negotiator for that matter. put Mr. Burns in the gear of negotiations. Peace will come, and a viable, democratic Palestinian State, with Jerusalem Its capitol, will not be compromised by President Obama, or any free loving human being. African, and not sematic but people of the Jewish faith. And Arabs inside Israel should be treated as equal citizens as those newly imported immigrants. Great Land of the Free. Israel’s policy of assassinating people it doesn’t like is mafia style politics. They also assassinated five Iranian nuclear physicists. There have never been any consequences to Israel for these assassinations. They get away with them. Israel is the rogue nuclear state, not Iran, but our government and mainstream media always protect them by censoring the news. An so it goes. The more Netanyahu roars his “nyet”, the more transparent is the massive hypocrisy with which he approaches negotiations with the Palestinians. He foments that Iran will be allowed to continue enriching uranium during this interim agreement while he continues building settlements as the clock ticks on the nine month window proposed by Mr. Kerry. In times like these – when cynicism runs high – it’s good to be reminded that President Obama selects people like William Burns to move diplomacy forward and military solutions a few inches backward – sending Mr. Netanyahu into paroxysms of rage that there are indeed limits – though hardly enough – to his ability to dictate to this administration. Thanks, Jim, for making this complicated current negotiation context a whole lot clearer. It is difficult, but so important, to find the words and ideas to respond to all the critics who surround us now. Keep writing!! Thanks Jim. This story about William Burns is very edifying, first because I love to see a man who quietly accomplishes historic success, secondly because I am glad to see I may be wrong about Obama on foreign policy. I thought Obama was showing his true colors on Syria before Putin wrote the New York Times. I did not have the heart to vote for Romney in 2012, so I voted for Jill Stein who wants to cut military spending by a third and to make peace in the Middle East, I am an old-fashioned Democrat in that I believe honest money and the middle class as did William Jennings Bryan, and like Bryan I think we should keep out of wars that are none of our business, including the First World War which was none of our business except as an honest broker for peace. For this reason I have been disappointed to see my old party get so distracted on hot-button social issues that they can’t pass workable health care legislation when they get the chance. It was unbearable when, on top of it all, their President wanted to bomb Syria without authorization of Congress. Anyway, I am glad that Lovrov has taught the facts of life to Kerry so we might see him nominated and elected in 2016..But I am even happier to learn that Obama is using Burns for good purpose,. Burns as secretary of state? What a Hail Mary play that would be! — J. R. G. . . Ambassador Burns’ father, Major General (USA retired) William F. Burns, was a close friend and fellow alumni of mine at La Salle University where I was to receive my commission in 1965. William J. Burns is also a graduate of La Salle. I have met him and have the highest respect for him. He is very intelligent and diplomatic but, most of all, a religious and wonderful person. The U.S. State Department is honored with his representation and character. He contributes immensely with his ability to overcome obstacles facing foreign policy, and I must include one of the greatest of all these obstacles, the Israeli lobby, AIPAC. I wish there were more like him with such stamina, morals, and virtue. Many thanks for an excellent piece featuring William J. Burns. Israeli leaders fret that, if Iran is no longer an “enemy” of the US, let alone a “friend” of the US, Israel’s disproportionate stranglehold over US foreign policy will lose its grip. Why should successive US administrations assign mostly biased Zionists – from Kissinger to Indyk – to handle the most sensitive issues of the Middle East? It seems to me that shining American Star, William Burns, should be the next Secretary of State when Kerry is done. I have no doubt that he will hold America’s interests and moral values, FIRST and FOREMOST.